I know I have an addiction to pillows — I can’t help it!! I love making pillow covers. It’s a really inexpensive way to update a space and decorate for different seasons or holidays. So when I was out and about on Friday, looking for cute fabric for projects, I saw a really cute pillow at Material Girls in South Jordan. 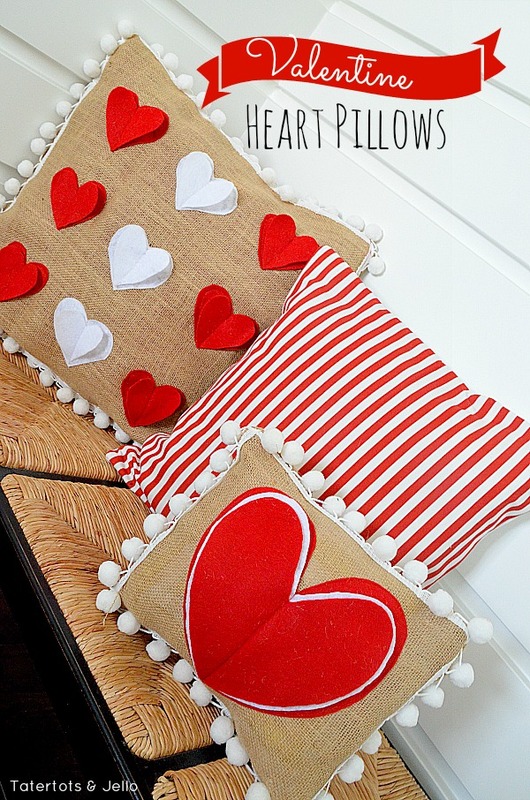 A burlap pillow with felt hearts and pom poms. Cute!! I thought about the pillow all day and on Saturday I decided that I really wanted to make one. Of course I had to make a few changes and make it my own. I used white pom poms and a row of white hearts down the center. 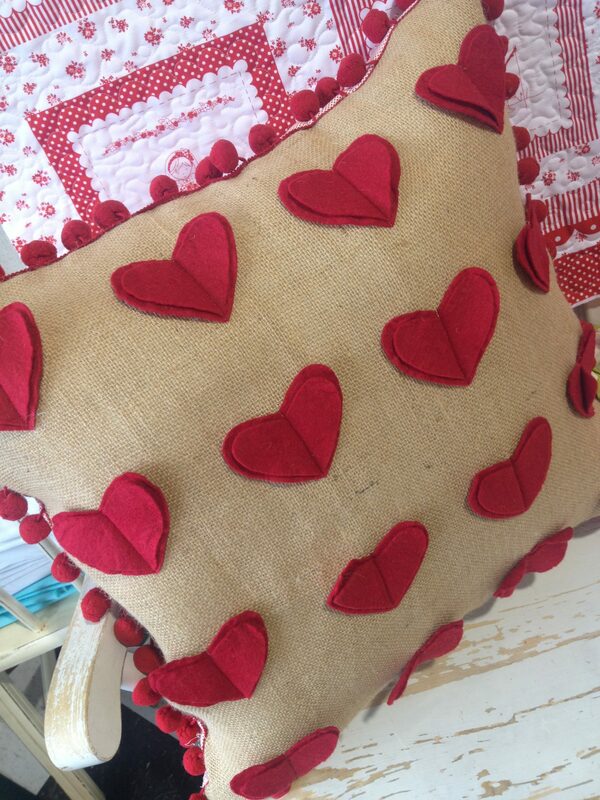 And then I also made a smaller pillow with one big heart with three layers of felt. I made the pillows as pillow covers so I could insert pillow forms I already had. And that way I can just take them off and store them in my Valentine’s Day bin and get them out again next year. I estimated the cost on these pillows and I made them for just a few dollars each. The felt I bought at the craft store in squares – they are .25 cents each. The burlap was $3 per yard and I used less than a yard for both pillows. The most expensive part was the pom poms. I bought the large pom poms by the yard at Hobby Lobby. And one nice thing about Hobby Lobby is that you can use your smart phone to look up their online coupon. So I was able to get 40% off the total length of the pom poms. Yay! 1. I measured my pillow form and added inch to each side for a big seam allowance. You will see why it’s so big in a minute. 2. I cut out the fabric. Since I used an envelope enclosure. Here’s a video tutorial that will show you how to make them. 3. Then I cut out the hearts. I experimented with a piece of paper to see how big and the shape of the heart I wanted to make. Once I had the right shape, I traced it onto the felt. Since I made two rows of red hearts with three hearts on each row and the hearts were doubled — I cut out 12 red hearts and 6 white hearts. The hearts that go on top of the other hearts are a little bit smaller. I just took the second layer of hearts and cut them down about 1/8 of an inch on all sides. 4. Then I pinned the pom poms onto the front of the pillow cover, leaving about 1/2 inch of burlap behind the pom poms. Make sure to lay the pom poms so that they lay facing outwards, not inwards. 5. Then I sewed the pom poms onto the front of the pillow. 6. 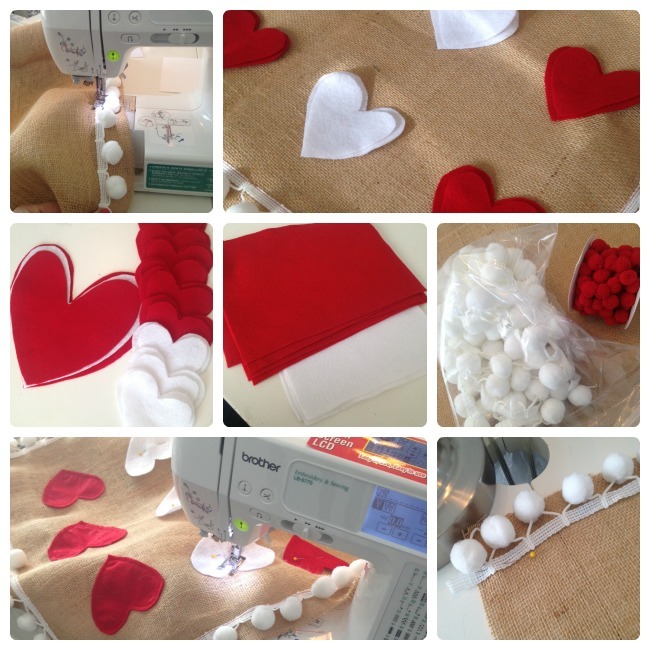 Once the pom poms were attached, I layed out the hearts and pinned one heart to each place. The hearts will be double when you are done, but you want to sew the first heart on and then attach the second heart on top of that one in a minute. 7. I sewed each heart onto the pillow, in three rows. I used small stitches on my machine and sewed very close to the outside of the felt heart. 8. Once the hearts were on, I pinned the second heart on top of the first. Then I sewed the second hearts on. Instead of sewing around the whole heart, I sewed a straight line down the center, attaching the outside heart to the inside and the burlap layer underneath. 9. When all of the hearts were sewed on, then I attached the back panels to the top. I layed the front of the pillow facing up, and then layed the back panels ontop of the front panel, right sides up. Then I pinned the two together, tucking the pom poms into the inside. 10. Then I sewed the pillow together. Since it’s an envelope enclosure, all I had to do once it was sewn was to pop it right side out by bringing the right sides through the opening in the back enclosure. And then I put the pillow form inside. The smaller pillow is almost exactly made the same way. The only difference is the size and I made the heart almost as big as the entire pillow. I also cut out three hearts instead of two. 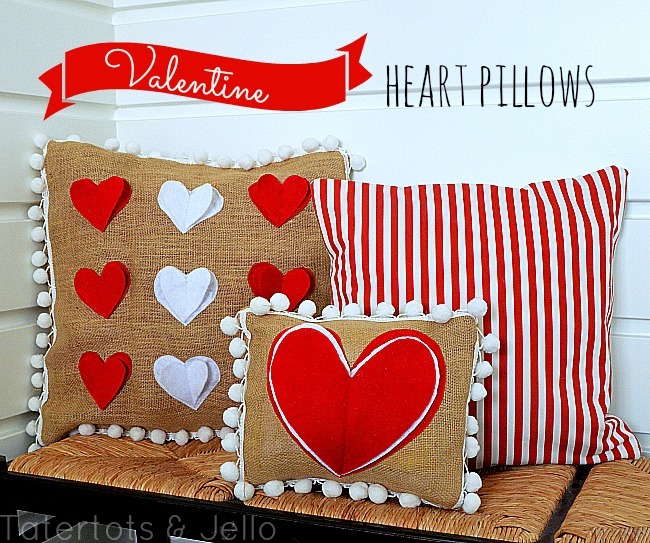 I also made some striped pillows and a polka dot heart pillow for my couch. The polka dot pillow was super simple to make. All I did was I cut out two pieces of fabric in a heart shape. And then I added pom poms to the front of one of the pieces, leaving about 1/2 inch of fabric on the outside of the heart. Then I sewed the two pieces of fabric together, right sides together with the pom poms inside. I left about a 4 inch section of the pillow open. Then I pulled the right sides of the pillow out through the opening and stuffed the pillow with batting. Once it was filled, I hand-stitched the opening closed. The fabric I used is from Ikea and is a laminated tablecloth material, so I never have to worry about washing that pillow. I can just wipe it down! yay. 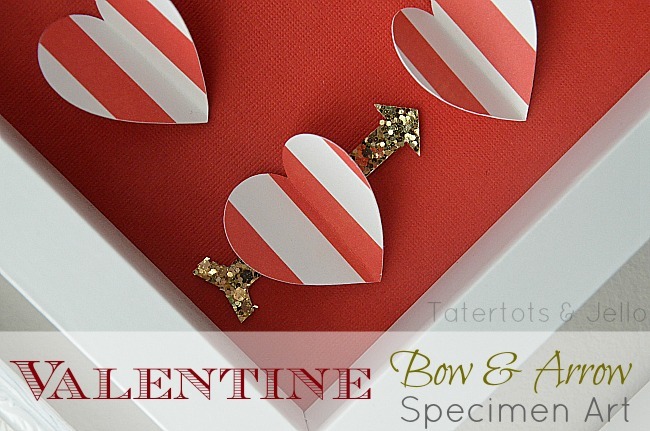 Have you made anything to celebrate Valentine’s Day? Share YOUR idea in the comments. I would love to see your idea! 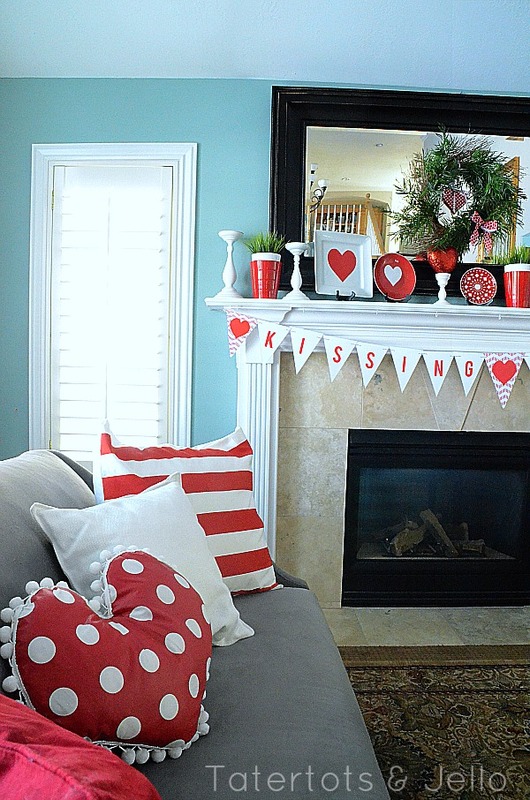 Great Ideas — 25 Valentine’s Day Projects to Create! Make Valentine’s Day Ruffle Balls — PLUS a giveaway every crafty person needs!! These are so stinking cute! Love making custom pillows!!! Jen, I LOVE these pillows, they are so stinkin’ adorable!!! Jenn, everything looks so bright and colorful. Great job! Thanks so much Lynn!! I appreciate you stopping by! I’m totally inspired by this! I love the 3D effect with the hearts. I’m going to brainstorm on my own version and make it happen! Ha! I knew when you posted that pic of the pillow this weekend that you would be making your own! It looks great! Now I want one! haha!! I know. I couldn’t resist. Thanks for the comment my cute friend! Pillows are one of my favorite things to make too! So easy to put together, but they can change the whole look of a room! So true!! I can’t resist pillows. I hope things are going well for you Kassi! These are so fabulous, Jen! I love the burlap mixed with the pom poms! I know. I loved the inspiration pillow. So cute! Thanks for the comment Bridgett! Thanks my cute friend!! Your home is looking very fesitve. I love your V-day decor! adorable, jen! love the pom pom trim! Thanks Kellie!! I think we both have a passion for pom poms!! They are fabulous. Love you! I saw your instagram of that pillow you saw and I took a screen shot to try to make one myself one day. So thanks for this tutorial! Ohhh, did you make any Eva? I would love to see yours! Awww! They’re so cute, Jen. I love that they are just covers that can be stored the rest of the year. Pinning! Thanks Christine!!! And thanks for the sweet comment! You are in Full Valentine Mode! Love your pillows. They add such a sweet touch to your home. haha!! I know. 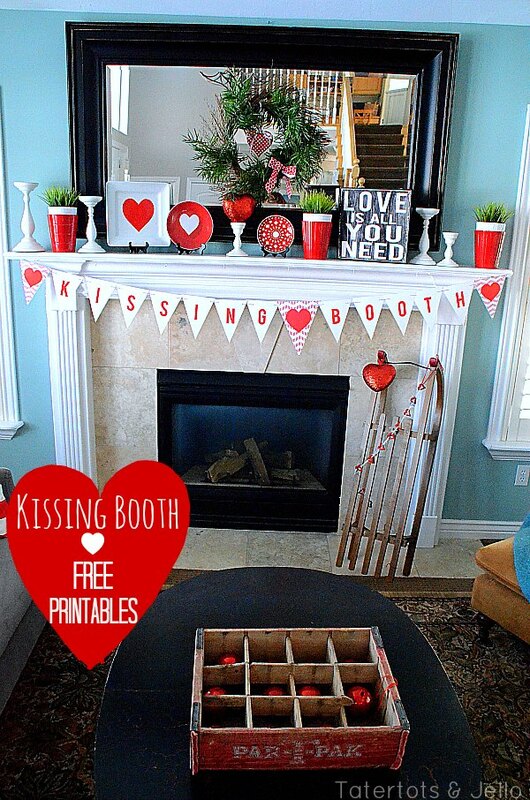 I am loving decorating for Valentine’s Day this year. Thanks for stopping by Suzanne! These are so cute Jen! 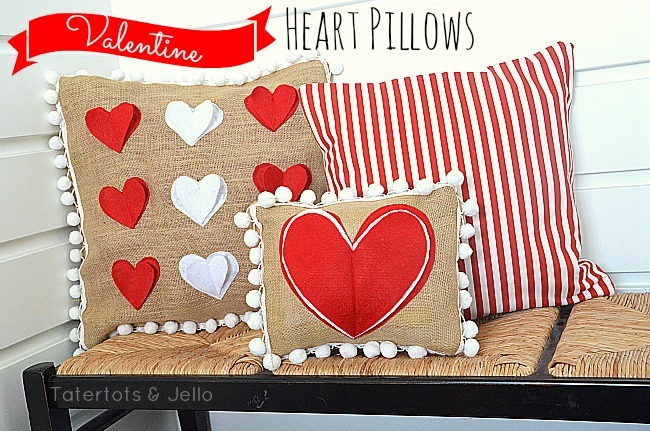 I love the layered hearts and the pom poms!! Bev!! Thanks for stopping by. And thanks for the sweet comment. I adore you! Thanks Holly and Nat!! I loved the one I saw and it was fun to take the idea and put my own spin on it. Thanks for the sweet comment! !